Animate Online Shop is taking orders for this Puella Magi : Madoka Magica doll of Charlotte the Witch. The plushy is of the infamous witch from the equally infamous episode 3 of Madoka. This doll stand about 12'” tall and actually turns inside out to become its 1.8’ secondary form. Not terifying enough? 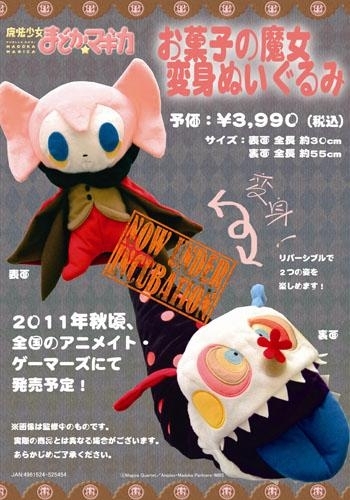 They also have a Kyubey cushion ready to nag you into signing a contact.